The School of Ballet Arizona faculty member Fabiana Poulis in class with students. Photo by Tzu-Chia Huang. At The School of Ballet Arizona, we offer an innovative approach to traditional classical ballet. All classes offer a unique syllabus that is taught in all divisions of the school and is followed by every faculty member. Each class features a live piano accompaniment to foster an understanding of the relationship between movement and music. 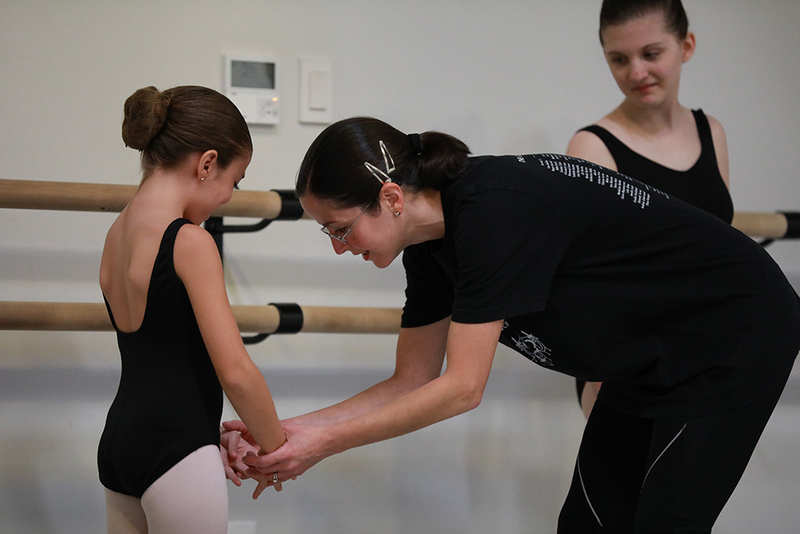 At The School of Ballet Arizona, the Lower Division is divided into four levels and the syllabus is created to begin formal training in traditional classical ballet. The syllabus progresses at a rate that allows the student to learn the exercises correctly and with full physicality. For the Upper Division, students meet 4-6 times a week. Students are introduced to a wider variety of classes, including Pointe, Variations, Pas de Deux, Modern, Flamenco, Men’s class and Conditioning. All Upper Division students are eligible to audition for Ballet Arizona’s The Nutcracker and possibly other Ballet Arizona productions. Ballet Arizona’s Studio Company is an opportunity for students of the highest rank with the potential and desire to become professional dancers. Studio Company members are selected by audition only and through The School of Ballet Arizona’s Summer Intensive Program. Studio Company members gain professional exposure and train with The School of Ballet Arizona’s School Director as well as Ballet Arizona Artistic Director and staff. Ballet Arizona is an innovative professional ballet company that creates, performs and teaches outstanding classical and contemporary ballet. The company is dedicated to preserving and celebrating classical dance while creating and commissioning new innovative works. We invite you to learn more about The School of Ballet Arizona. Check out our upcoming school year and summer programs!